Exciting progress recently has been made in our understanding of idiopathic membranous nephropathy, as well as treatment of this disease. Here, we review important advances regarding the pathogenesis of membranous nephropathy. We will also review the current approach to treatment and its limitations and will highlight new therapies that are currently being explored for this disease including Rituximab, mycophenolate mofetil, and adrenocorticotropic hormone, with an emphasis on results of the most recent clinical trials. This is an especially exciting time in the history of idiopathic membranous nephropathy (IMN). Our understanding of its natural history and pathogenetic mechanisms has been slowly evolving over several decades but has recently gained more momentum. This, in conjunction with data from recent clinical trials, makes it an ideal time to revisit our approach to patients with IMN. The recent identification of the M-type phospholipase A2 receptor (PLA2R) as the first major human antigenic target in adult onset IMN represents a major milestone in understanding of the pathogenesis of this disease. In 2009, Beck et al. reported that the majority of IMN patients (70%) have circulating antibodies against PLA2R, a cell surface transmembrane receptor expressed on the surface of podocytes.1 Compelling work from Beck et al. suggests that the subepithelium-like deposits, characteristic of IMN, are formed from in situ binding of circulating anti-PLA2R autoantibodies to the PLA2R antigen. From a historical perspective, the findings of Beck et al. come 50 years after Heymann et al. first described an experimental model of membranous disease known as Heymann nephritis by injecting rats with an antigenic preparation of kidney extracts.2 Elegant work over several decades on this now well established rat model shed light on the immune events and molecular basis for podocyte injury in membranous lesions and generated hypotheses regarding their relevance in human disease.3–9 Indeed, the findings of Beck et al. are in agreement with a critical prediction of the Heymann model that circulating autoantibodies directed against a podocyte moiety cause IMN. Additional podocyte autoantigens including SOD2,16 aldose reductase,16 α-enolase,17 and neutral endopeptidase18 are also implicated as targets for specific autoantibodies in some IMN patients. Antibodies to these targets may be relevant in patients who are negative for PLA2R antibody. Unlike the anti-PLA2R antibody, correlation of antibody titers for these antigens with disease activity has not been reported to date. We have only touched the tip of the iceberg, and there is still so much to learn. Nevertheless, what has been uncovered thus far is certainly provocative and will advance our approach to diagnosis, monitoring, and treatment of patients with this disease in the near future. Application of new technology is allowing for a much faster transition of these bench-side findings to the bedside, and progress has already been made in developing standardized immunoassays for anti-PLA2R for use in clinical practice. One can envision how integrating information obtained from genetic testing and antigen-antibody profiling might potentially be applied for individual patient management and in future clinical trials in that it may help to better classify subsets of patients with different prognoses or to predict response to treatment. Measurement of circulating anti-PLA2R and other antibodies may be used in conjunction with proteinuria to better assess disease activity and provide a more informative definition of clinical remission. Such information might provide insight as to whether persistent proteinuria in patients is related to ongoing immunologic activity, amenable to more immunosuppression, or due to fixed structural damage to glomeruli or tubulointerstitium. Future clinical trials might use such information to identify and enroll a more homogenous population of patients at higher risk of disease progression who would most benefit from immunosuppression. In addition, comparison of efficacy of immunosuppressive agents in trials might involve evaluation of their effect on immune activity, including the timing and kinetics of autoantibody clearance from the circulation. As we move forward in our understanding of the pathogenesis of disease in IMN, two recent studies re-examine more basic concepts regarding the natural history of IMN.21,22 These concepts were largely derived from studies performed 2–3 decades ago, when antiproteinuric strategies and other supportive measures were implemented inconsistently.23–26 Moreover, some of the older studies included patients with non-nephrotic–range proteinuria, a group with an invariably good prognosis.25,27 In contrast, these contemporary studies include only nephrotic patients, make greater use of antiproteinuric strategies, and serve as important references to inform management decisions in these patients. Two features regarding spontaneous remissions in the Spanish study21 deserve consideration. First, among patients destined to experience a spontaneous remission, proteinuria tended to decline gradually. Moreover, a decrease in proteinuria during the first year of follow-up >50% of baseline (even if still nephrotic) significantly predicted spontaneous remission. Second, spontaneous remissions were observed among some high-risk patients, including approximately 25% of those with severe proteinuria (>8 g/24 h) as well as a number of patients with CKD,29 another subset considered unlikely to undergo spontaneous remission. Consequently, careful observation of some high-risk patients may be appropriate before starting immunosuppressive therapy, particularly if they are not experiencing complications of the nephrotic syndrome or declining renal function and if they are manifesting a gradual decline in proteinuria. Concordant with previous reports,30 the long-term outcome and renal survival of those with spontaneous remission (either complete or partial) is excellent, with a 0% risk of ESRD and a 2% mortality rate.21 In contrast, outcomes in patients who have persistence of nephrotic-range proteinuria are less favorable, with a 11% mortality rate and a 19% risk of ESRD. A second contemporary natural history study from the United Kingdom by McQuarrie et al. analyzed patients diagnosed between 1997 and 2008.22 Almost all patients were treated with ACE inhibitors and/or ARBs. Consistent with the above data and previous reports,30 this study showed that achieving any remission (spontaneous or treatment-induced) independently associated with a reduced risk of requiring renal replacement therapy (hazard ratio, 0.02; 95% confidence interval, 0.0–0.2; P=0.001) and reduced risk of death (hazard ratio, 0.07; 95% confidence interval, 0.02–0.3; P=0.001). Immunosuppressive therapies that have received the most attention for IMN include alkylating agents such as cyclophosphamide and chlorambucil, calcineurin inhibitors (CNIs) such as cyclosporine and tacrolimus, mycophenolate mofetil (MMF), rituximab, and adrenocorticotropic hormone (ACTH). Table 1 shows the commonly used regimens, although many variations exist. There is a lack of well powered, randomized, controlled trials that formally compare therapies. The quality of the existing evidence for these different regimens in IMN is variable. Comparisons among studies are hampered by differences in the risk profiles28 of the patients and variable duration of follow-up, among other factors. Jha et al. permitted crossover to the immunosuppressive treatment arm 24 months after randomization to supportive treatment.41 It is notable that remission rates were lower among patients who switched to immunosuppression as rescue therapy (47%) than among those who were initially randomized to immunosuppression (72%), suggesting that delay in immunosuppressive therapy until evidence of disease progression diminishes efficacy. Studies reported by du Buf-Vereijken et al. and Hofstra et al. from the Netherlands provide additional insights into the effect of delaying cytotoxic drug therapy for IMN until there is evidence of renal function deterioration.34,42,44 These investigators favor this restrictive treatment policy because it identifies patients at highest risk of progression and avoids unnecessary immunosuppression in patients with a more favorable prognosis. A beneficial effect of this approach in attenuating deterioration of renal function was shown in the case-controlled study of high-risk IMN patients reported by du Buf-Vereijken et al.34 Renal outcomes of 65 patients treated for 1 year with oral cytoxan and steroids were compared with 24 historical matched control patients. Control patients received either no immunosuppression or treatments that have subsequently proven to be ineffective (prednisone monotherapy, intravenous cyclophosphamide, or both). Patients had an impaired GFR at baseline (median creatinine clearance of 42 ml/min per 1.73 m2) and high-grade proteinuria. Remission of proteinuria was achieved in 86% of 65 patients receiving immunosuppressive therapy (Table 2). At 5 years, a renal survival advantage was evident in cytoxan-treated patients compared with controls (86% versus 32%; P<0.001). 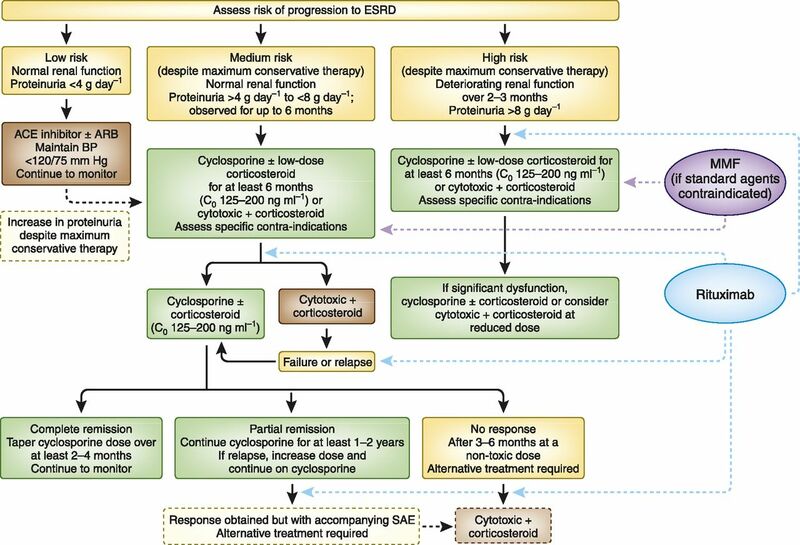 The renal survival of these cytoxan-treated patients at 7 years was 74%, which is somewhat lower than the 10-year renal survival of patients with normal baseline renal function treated with a cytotoxic drug regimen by Ponticelli et al.40 (92%). Hofstra et al. recently reported the results of a small but well designed study comparing early versus late initiation of immunosuppressive treatment.42 Patients were randomized to receive oral cyclophosphamide for 12 months plus corticosteroids early after diagnosis (n=14) or later if renal function deteriorated (n=12), defined as an increase of serum creatinine ≥25% reaching a level of ≥135 umol/L or an increase of serum creatinine ≥50%. In the late treatment arm, 67% of patients ultimately met criteria for immunosuppression after a median of 14 months from randomization. Overall cumulative incidence of remission was similar in both the early and late treatment arms (93% versus 92%, respectively) but earlier treatment resulted in more rapid onset of remission. Relapse rates were similar. At final follow-up (mean 72 months), there were no differences in clinical status, proteinuria, or renal function in either group, with the latter observation indicating that immunosuppressive treatment led to an improvement in renal function in the late treatment arm (because those patients started out with a lower average GFR). The good overall outcomes do provide reassurance that delaying therapy is justified in some patients. By delaying treatment, 33% of patients avoided unnecessary exposure to immunosuppression. However, delayed treatment was associated with more frequent and severe side effects and more hospitalizations. An individualized approach that considers age, pre-existing comorbidities, and risk of treatment versus risk of complications of the nephrotic syndrome is critical when deciding on therapy. Relapse upon drug withdrawal is a well recognized problem with CNIs, occurring in 13% to almost 50% of patients within 1 year of drug withdrawal.49 In the above-mentioned study by Praga et al., 47% of patients randomized to tacrolimus relapsed within an average of 4 months after discontinuation of therapy such that by final follow-up, the number of remissions in the tacrolimus arm was not markedly different from the placebo arm.49 These data provide additional justification for long-term treatment. Maintenance therapy with low-dose cyclosporine (1.4–1.5 mg/kg daily; trough levels >100 ng/ml), possibly in conjunction with low-dose steroids (0.1 mg/kg daily), may help to reduce the likelihood of relapses55; however, this practice has not been formally tested in randomized controlled trials. The role of CNIs in attenuating a decline in renal function and the long-term effect on renal survival in IMN are less clear due to lack of longitudinal studies.56,57 Cattran et al. reported reduced rates of deterioration of renal function with cyclosporine in one small study of high-risk patients.56 In a study design similar to that used by du Buf-Vereijken et al.,34,44 65 patients with IMN were initially followed conservatively for 12 months. Only patients with clear evidence of declining renal function and persistent nephrotic-range proteinuria during the observation period were randomized to receive treatment with cyclosporine for 12 months or placebo. Of 65 patients, 23 (36%) met criteria for randomization. Compared with placebo, cyclosporine-treated patients demonstrated significantly reduced proteinuria (halving of proteinuria in 50% of treated patients versus no improvement in placebo patients) and slower rates of decline in kidney function as measured by change in the slope of creatinine clearance. These improvements were sustained in 75% of the patients for up to 2 years post-treatment. Fewer patients in the treated group progressed to end stage (11% versus 50%, respectively). In contrast, a controlled trial by the Cyclosporine in Membranous Nephropathy Study Group failed to demonstrate any long-term benefits of cyclosporine when used in patients with deteriorating renal function.58 In light of the nephrotoxic potential of calcineurin inhibitors, caution and close monitoring of blood drug levels and renal function are advised if CNIs are initiated in patients with an impaired GFR at the start of therapy and/or severe tubulointerstitial damage on renal biopsy. No prospective randomized head-to-head comparisons of cyclosporine (or tacrolimus) to standard regimens of alkylating agents have been conducted. A retrospective study by Goumenos et al. attempted to address this issue by comparing the outcomes of patients who were treated with a 6-month Ponticelli protocol (steroids plus chlorambucil or cyclophosphamide; n=31) with those treated with cyclosporine for 2 years plus steroids (n=46).59 The use of different therapeutic regimens in the two groups reflects institutional treatment preferences over a 10-year period. Baseline characteristics of the groups were similar. More remissions occurred among the cyclosporine-treated patients than among those receiving alkylating agents (85% versus 55%; P=0.004). Relapses tended to occur more often in the cyclosporine-treated group but the differences were not significant (41% versus 29%, respectively). During a mean follow-up of 48±36 months there were no differences in rates of doubling of serum creatinine between treatment groups (26% versus 23%, respectively) or requirement for renal replacement therapy. However the design and retrospective nature of the study preclude definitive comparisons of these therapies for IMN. A recent multicenter randomized controlled trial from China compared efficacy of tacrolimus with an abbreviated course of cytoxan in 73 patients with IMN.50 Patients were randomized to receive tacrolimus for 9 months or 4 months of daily oral cytoxan (100 mg/d). Both groups received oral prednisone. Cumulative remission rates at 6 months were greater in the tacrolimus arm than the cytoxan arm (85% versus 65%, P<0.05); however, remission rates were comparable by 12 months. Relapse rates between the two groups were similar (18% versus 23%), leading the authors to conclude that short-term efficacy of tacrolimus plus steroids might be better than cyclophosphamide plus steroids. Several issues limit the conclusions that can be drawn from this study. Tacrolimus was not compared with one of the standard cytoxan-containing regimens. Follow-up was very short, which may underestimate true relapse rates. Last, there was inconsistent use of ACE inhibitors and ARBs, which favored the tacrolimus group. Currently, there is a three-arm randomized controlled trial in progress in the United Kingdom that compares supportive therapy versus 12 months of cyclosporine versus 6 months of alternating prednisolone/chlorambucil in patients with progressive IMN. The results of this trial are eagerly awaited and should provide information regarding this important group of patients. Regardless of the regimen administered, proteinuria tends to decline slowly and remissions may occur up to 2 years after treatment (Table 4). Interestingly, Beck et al. showed that after administration of rituximab, the median time to reach undetectable anti-PLA2R levels was 9 months (range, 1–18 months).14 This may explain the delay in remissions, because the reduction in antibody levels seems to precede the decline in proteinuria by months. It is interesting to note that remissions continue to occur well after the end of therapy with rituximab or alkylating agents; complete remissions can be seen >12 months after the completion of these interventions. This is in contrast to what is observed after cyclosporine or tacrolimus, in which typically no additional remissions occur once treatment stops. Relapse rates after rituximab therapy are difficult to estimate given the limited longitudinal data. There are two published studies (n=31) that followed patients for up to 24 months64,66 and relapses were infrequent (6% and 13%, respectively). It is hoped that forthcoming studies with extended follow-up will provide much needed information. Such data may inform decisions regarding role and timing of redosing. Currently, there are no established guidelines regarding the issue of retreatment and investigators have taken different approaches. In one study, Fervenza et al. retreated patients with rituximab after 6 months, only if B cells recovered (B cells ≥15/μl) and patients had nephrotic-range proteinuria.65 In another study from the same institution, all patients were retreated 6 months after the first course of rituximab, regardless of clinical status.66 Remuzzi et al. have redosed rituximab (with single doses of 375 mg/m2) when there is evidence of relapse of nephrotic-range proteinuria (rather than empirical retreatment).63 Whether empirical redosing at 6 months, or other predefined intervals, provides added benefit with respect to durability of remissions or number of remissions is not clear. In light of the preliminary observation that re-emergence of anti-PLA2R antibody in the circulation precedes recurrence of disease, serial measurements of the antibody may help guide decisions regarding retreatment. There are several advantages of rituximab that add to its appeal. It appears effective as monotherapy, and the side effect profile may be more favorable than with other agents (i.e., with no hypertension or potential for nephrotoxicity). Conversely, the long delay in reduction of proteinuria may be problematic in patients who suffer from severe complications of nephrotic syndrome. Combining rituximab with an abbreviated course of another agent that has a quicker onset of antiproteinuric effects (CNIs) is an approach that we are currently investigating. We do need to have a balanced perspective regarding the toxicity profile of rituximab. Although acute infusion reactions are often mild and manageable (e.g., fever, chills, pruritus, and skin rash), more severe and potentially fatal reactions (e.g., acute respiratory distress syndrome, bronchospasm, angioedema, shock and myocardial infarction) as well as potentially fatal mucocutaneous reactions (e.g., Stevens–Johnson syndrome and toxic epidermal necrolysis) can occur. Rare cases of the devastating demyelinating central nervous system disease, progressive multifocal leukoencephalopathy, have also been reported, although typically when administered as part of multidrug immunosuppressive regimens. Finally, the long-term safety profile of rituximab in glomerular diseases is largely unknown, particularly if repeated courses are needed. Controlled prospective trials are needed to compare the efficacy and toxicity of rituximab with CNIs and cytotoxic drugs. More data are needed to clarify the role of rituximab in patients with impaired or declining renal function and the effects of rituximab on hard endpoints such as dialysis and death. A randomized controlled trial comparing rituximab with cyclosporine is underway and hopefully will provide much needed answers. A trial from the Netherlands compared outcomes of 32 IMN patients treated with 1 year of MMF plus corticosteroids with historical matched controls treated with oral cyclophosphamide plus corticosteroids for 1 year.75 Patients were considered at high risk for progressive disease with reduced GFR at baseline (median approximately 40 ml/min) and high-grade proteinuria. The two groups achieved similar initial remission rates (approximately 70%). Renal function stabilized or improved in the majority of patients during the year of therapy with MMF. However, the post-treatment relapse rate was considerably higher in the MMF group such that by the end of follow-up (median 23 months), patients in the MMF arm were less likely to be in remission than those in the cytoxan arm (44% versus 75%; P=0.02). Post-treatment relapse is problematic. In the trial by Branten et al., 57% of patients relapsed within 2 years and some relapses occurred during active treatment.75 Of interest, relapse is also a concern after treatment with the related older antimetabolite, azathioprine.80,81 A recent study showed that 12 months of azathioprine induced remissions in a large percentage of patients who had previously been refractory to the Ponticelli protocol.52 However, within 6 months of azathioprine withdrawal, 33% relapsed. Although the initial enthusiasm regarding MMF has quieted, a place for MMF in treatment of IMN cannot be discounted at this point. However, until more data become available, it is difficult to recommend MMF as initial therapy. It may be a reasonable option for patients in whom toxicity of alkylating agents and high-dose steroids are a concern or when significant azotemia prohibits use of CNIs (Figure 1). MMF has been used with some success as rescue therapy in patients resistant to other immunosuppression and has also been tried as adjunctive or maintenance therapy to avoid prolonged exposure to CNIs71; however, the evidence is too limited to recommend routine use of MMF for these indications. Extended duration of treatment (>12 months), and possibly the addition of oral corticosteroids, may be necessary to achieve greater antiproteinuric effects or to prevent relapse. The optimal target dosing of MMF for IMN is not known because the kinetics of MMF in patients with hypoalbuminemia and nephrotic syndrome are not well defined. It is possible that higher drug doses are needed to reach the therapeutic window. Current consensus guidelines for treatment of IMN, adapted from Cattran et al.48 Possible positions of MMF and rituximab in treatment scheme based on available data (but not currently in guidelines). SAE, severe adverse event. A different formulation of ACTH, a natural highly purified gel, is available in the United States (corticotropin; Questcor Pharmaceuticals Inc, Anaheim Hills, CA). In a retrospective study of corticotropin in proteinuric glomerular diseases, 9 of 11 (82%) patients with IMN achieved a remission (three complete; six partial). The complete remissions occurred in patients with relatively low levels of baseline proteinuria (2.6–4.8 g/d). Interpretations of the data are limited due to the uncontrolled nature of the study, the variable dosing regimens used, a possible carry-over effect from previously administered immunosuppression, and short follow-up (beyond the active treatment period). The experience with ACTH, particularly in the United States, is far too preliminary to consider using this treatment outside of clinical research studies. A trial is currently underway to more formally evaluate the efficacy of ACTH gel as secondary therapy in patients who have failed conventional therapy. Figure 1 summarizes two widely used treatment options for immunosuppressive drugs in patients with IMN at moderate to high-risk of renal deterioration. These options, CNIs and cytotoxic drug therapy, have been incorporated into consensus recommendations48 on the basis of the clinical studies discussed in this review. Randomized controlled trials are needed to compare the efficacy and toxicity of rituximab with these regimens. Additional studies are needed to identify the optimal rituximab regimen for this condition. Consequently, at the present time, it would be ideal to refer patients to ongoing clinical trials of rituximab in order to address these important issues. MMF is another relatively new immunosuppressive agent that has been used (but not extensively studied) for the treatment of IMN. Therefore, it is difficult to determine its role in the standard approach to IMN. It would be sensible to consider MMF as an alternative therapy when the risk profiles of CNIs or cytotoxic drugs are considered unacceptable. Figure 1 reflects where rituximab and MMF might potentially fit into the treatment scheme on the basis of the available data. As previously discussed, there is too little information to recommend using ACTH outside of the context of a clinical research study. Ongoing studies of pathogenic mechanisms and innovative treatments will refine our approach to the treatment of membranous nephropathy. This research was supported in part by the Intramural Research Program of the National Institute of Diabetes and Digestive and Kidney Diseases, National Institutes of Health.